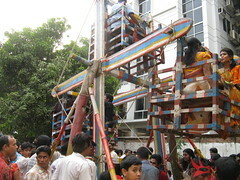 My trip to Dhaka coincided, once again, with the Bengali New Year, which occurs on April 14. My very first trip to Dhaka also coincided with the New Year. This time, although my colleagues here offered to take me to see the major celebrations again, I decided to go to a smaller venue with my coworker from Ottawa who is also here, and one of here Bangladeshi colleagues. We headed to a nearby university at about 4pm on Wed (there are many universities in Dhaka) where there was a concert and fair going on to celebrate the new year. It was about 5 blocks from the hotel, which was quite convenient. The fair was set up in a small park. Along one side were several stalls selling t-shirts and things. Krista (my Ottawa coworker) and I had designs painted on our hands. Mine sweated off in a matter of minutes. It was really hot! We wandered around a bit, and watched a small human powered ferris wheel go round and round. That’s when Krista’s colleague, Iftikar, decided we should try the ferris wheel! Now that was an experience. The thing is made out of wood and rope, and powered by a man who pulls the carts down and around! It actually went pretty quickly! On our second go around, a little girl came and joined us in our cart – supposedly to even out the weight, but that didn’t really work considering she was supposed to be balancing a full grown man. After that we hung around and enjoyed the concert with Iftikar and his university friends. 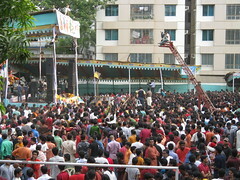 There were several performers, playing a mix of typical bengali music and rock music. The last performer (whose name was Mila) was apparently quite well known and the crowd was dancing and singing along to the music. It was pretty fun to watch! After the show, we headed over to an ice cream shop and had some ice cream before heading back to the hotel around 8:30pm. It was quite a day!! Unfortunately for me, the day wasn’t over. I obviously ate something at some point during the day (lunch? Ice cream?) that did not agree with me and was up with food poisoning for the entire night. You do not want to hear the details. Suffice it to say I did not go into the office on Thursday, but did have my first visit to a Bangaldeshi doctor, who told me I would be fine (which is pretty much what I figured…but my colleague here wanted me to see a doctor). Everyone at the hotel and the office was very helpful, and their care was much appreciated. I am back up on my feet now, the weekend is over and tomorrow it is back to work for the second and last week of my visit.